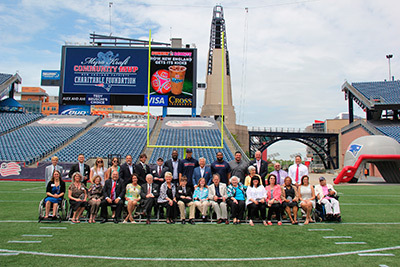 June 2014 The Kraft family and New England Patriots Charitable Foundation’s Myra Kraft Community MVP Awards place a spotlight on those who give their time to help others and exemplify leadership, dedication and a commitment to improving their communities through volunteerism. Annually, the Kraft family and New England Patriots Charitable Foundation host the awards program as part of the ongoing Celebrate Volunteerism initiative in honor of Myra Kraft’s example of being a lifelong volunteer. On June 9, twenty-six volunteers were recognized for their contributions at a luncheon and awards ceremony at Gillette Stadium. Each Community MVP received grants for their respective nonprofit organizations. Fifteen New England based organizations were presented with $5,000 grants in honor of their volunteers’ work. Ten others received grants of $10,000 and one grand prize winner was presented $25,000. Hildy Grossman of Brookline, Mass. was one of fifteen $5,000 third place winners. Following her treatment for lung cancer eight years ago, Grossman turned her experiences and passion for theater into a way of supporting lung cancer research. She has been coordinating productions ever since then and each show Grossman puts together includes an educational component so that attendees learn more about lung cancer. Her efforts have helped raise thousands of dollars for research and spread awareness of the disease to thousands of spectators. Patriots Chairman and CEO Robert Kraft, Patriots linebacker Jerod Mayo, Patriots and Pro Football Hall of Famer Andre Tippett and Patriots alumni and three-time Super Bowl Champion Joe Andruzzi congratulated the Myra Kraft Community MVP Award $5,000 winner Hildy Grossman from Upstage Lung Cancer for her outstanding volunteerism. During the luncheon, the Kraft family through the New England Patriots Charitable Foundation awarded $200,000 in grants to 26 New England nonprofits. Patriots Chairman and CEO Robert Kraft, Patriots Charitable Foundation President Joshua Kraft, and Patriots and Pro Football Hall of Famer Andre Tippett were joined by Patriots quarterback Tom Brady and linebacker Jerod Mayo, and Patriots Alumni and 3-time Super Bowl Champion Joe Andruzzi to celebrate their award on the field of Gillette Stadium. The 26 volunteer winners range from 13 to 93 years old, with one winner from each state in the region. Winning nonprofits provide support for many causes, including military member support, education, victims of domestic violence, healthcare, and health and fitness to name a few.